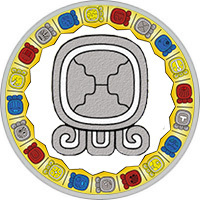 Mayan Name: TIJAAX / Eznab. Compatibility: Flint, Wind, Death, Dog, Jaguar. In the Mayan calendar, the sign of Flint (Eznab) is a symbol of the sacrificial knife. The meaning of the sign is a sword, a knife, a pyramid, flint, a patron — Kukulkan. A knife is the weapon of a strong, brave warrior. In the representation of the ancient Maya, the dissecting knife deprives man of the integrity of consciousness. Therefore, people are doomed to a long, painful process of gaining a lost unity. The knife is associated not only with the warrior, but also with the healer. The surgeon uses it as an instrument that heals the patient. Thus, the sign of Flint symbolizes the harmony, enlightenment, spiritual potential of man. On the horoscope Maya peoples of Flint sign — warriors, their element — the struggle, conflict. Throughout life are in the thick of events, often negative. They have strong will, strong nerves. In disputes and conflicts, they remain calm, but they always uphold their point of view, they do not take into consideration even close people’s opinions. Too important representatives of this day do not make concessions and compromises, think in categories: black — white, love — hate. Struggle, disputes, conflicts are a reflection of their inner need for harmony. Painfully trying to find peace of mind, strive for excellence. In matters of work and career, the people of the Flint sign are connoisseurs of their work, excellent specialists. Purposefulness, determination are qualities that make it possible to succeed in the profession. They are considered disciplined, responsible employees, always in good standing with the management. But the habit of speaking only the truth often leads to conflicts with colleagues. The most suitable activity is not connected with constant moving and intense communication. In this case, they have enough time for reflection, searching for truth. Among the representatives of the sign of Flint are people of various professions: actors, writers, politicians, sportsmen. Representatives of the Flint sign are single-minded people, devoid of sentimentality. Women and men of this day clearly follow their desires, without being distracted by unnecessary reflections and emotions. Always achieve reciprocity, even if the chosen one demonstrates inaccessibility and coldness. Do not pay attention to the opinions of others, follow the call of the heart. They can make a very unexpected choice and lead to a person’s crown, much older or younger than himself. They find happiness in the union with a partner who has endurance and calmness. According to the horoscope of Maya, the man of the Flint sign is a reliable protector. A brave and brave warrior can defend the honor of his beloved woman. With fearlessness rushes to solve her life problems. His energy is more than enough for work and for personal life. The only problem in communicating with him is intransigence. Natural stubbornness does not allow you to listen to the arguments of reason and people’s opinion. Quite often, he repels from himself even the most devoted admirers. According to the compatibility horoscope, he is approached by a soft, indecisive woman who will appreciate love and care. In the eyes of people around them, the woman of the Flint sign is a determined person, adamant to her own, and even less to other people’s weaknesses. He believes that every respectable person should have a solid character. It is not attracted by weak, insecure men. Strives to build strong relationships with a strong partner, although her reluctance to give in often leads to family conflicts. The representative of this day should be softer and feminine. Wisdom, patience, restraint are qualities necessary for life, full of tranquility and harmony.